.NET Core is lovely. It’s usage is skyrocketing, it’s open source, and .NET Core 2.1 has some amazing performance improvements. Just upgrading from 2.0 to 2.1 gave Bing a 34% performance boost. 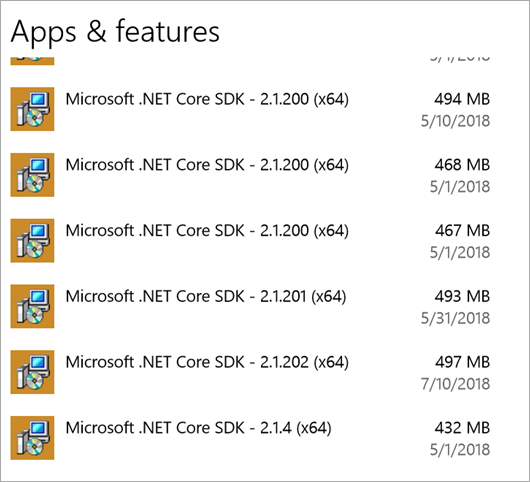 However, for those of us who are installing multiple .NET Core SDKs side by side have noticed that they add-up if you are installing daily builds or very often. 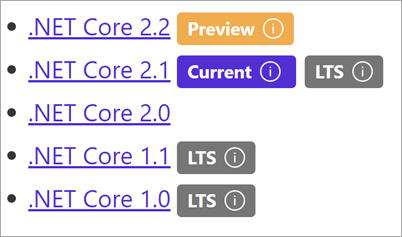 As of 2.x, .NET Core doesn’t yet have an “uninstall all” or “uninstall all previews” option. There will be work done in .NET Core 3.0 that will mitigate this cumulative effect when you have lots of installers. Here’s a PowerShell Script you can run on Windows as admin that will aggressively uninstall .NET Core SDKs. Here’s the script, which is an improvement on Andrew’s comment here. You can improve it as it’s on GitHub here https://github.com/shanselman/RemoveDotNetCoreSDKInstallers. This scripts currently requires you to hit YES as the MSIs elevate. It doesn’t work right then you try /passive as a switch. I’m interesting if you can get a “torch all Core SDK installers and install LTS and Current” script working. $_.Name -match "Microsoft .NET Core SDK"
This PowerShell is Windows-only, of course. Let me know if this script works for you.